Toys for children are provided. Looking through the garden to the Cherry Hill Cottage. 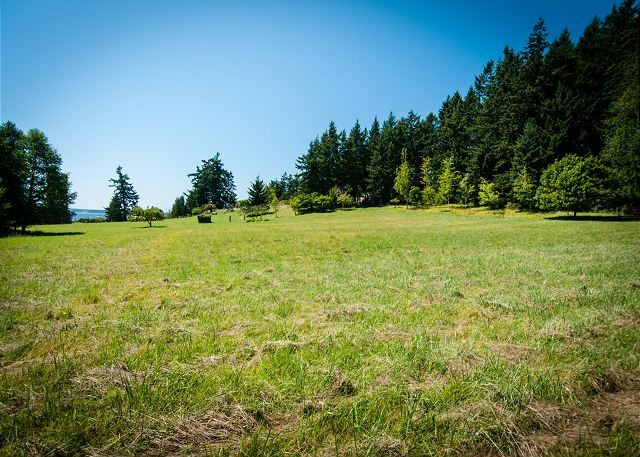 Sprawling acreage with lots of room to relax, play, and explore! 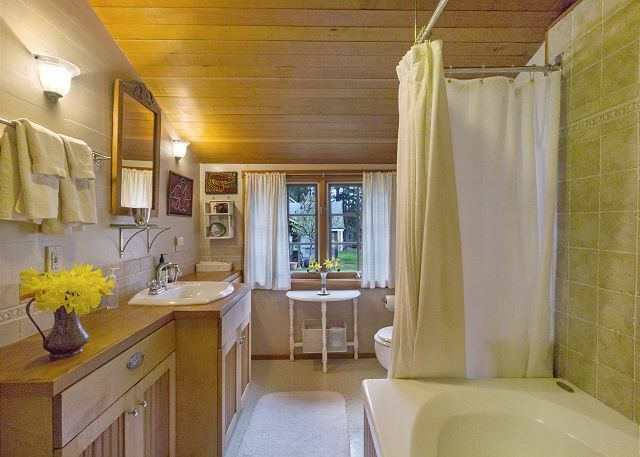 Cherry Hill Cottage - Relax and enjoy the peaceful surroundings at the Cherry Hill Cottage. 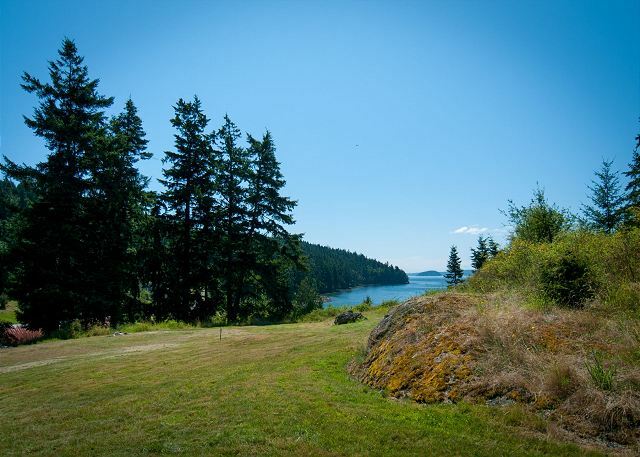 The cottage is situated on nearly 10 acres overlooking Buck Bay where you can watch the boats and ferries go by. 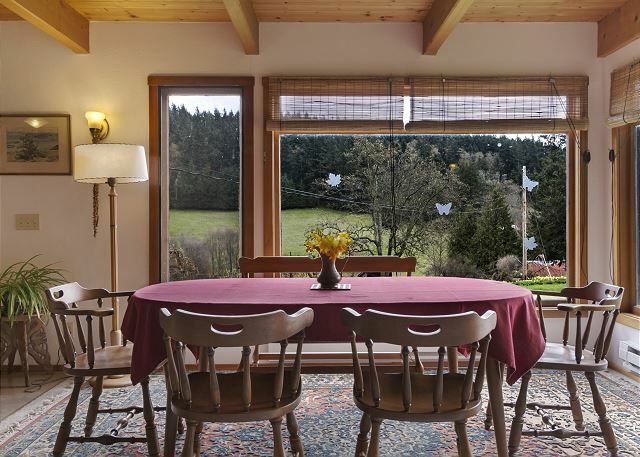 Cherry Hill offers great outdoor space including trails to meander and watch the deer and other native wildlife, a beautiful garden, and beach access just across the driveway. 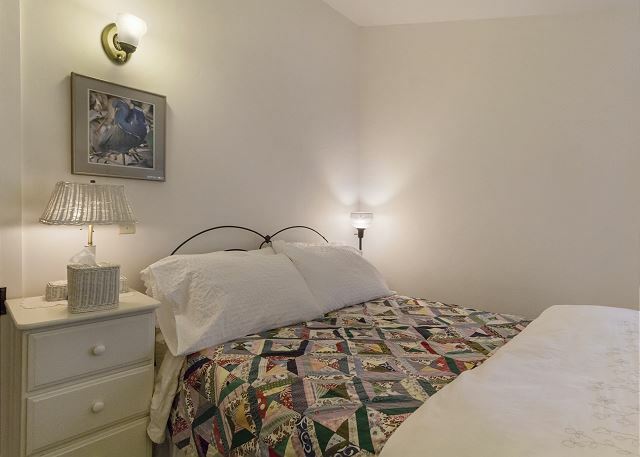 The darling cottage is well equipped with a fully equipped kitchen and ample dining space. Relax and enjoy a movie from the extensive video library on the Smart TV/Blu-Ray or stream videos from your own Netflix, Hulu or Amazon accounts. There is no TV service. 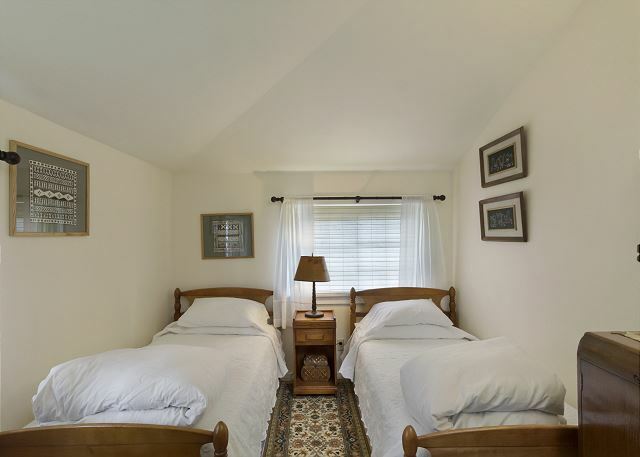 The cottage offers three bedrooms: New mattress for the bedrooms. One bedroom offers a queen size bed, the second bedroom offers a double size bed and the third bedroom is furnished with two twin size beds. Cherry Hill offers a variety of amenities including children's toys and games and a pack n play and high chair, outdoor games such as crochet, buckets for finding your beach treasures, and a charcoal barbeque for preparing your daily catch. There is a wood burning stove in the home but is not available for guests use. 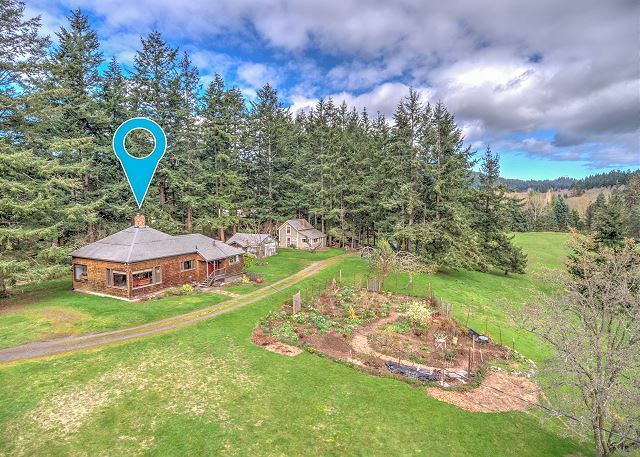 The cottage is located just minutes from Moran State Park and the Obstruction Pass State Park offering easy access for bike riders or hikers. 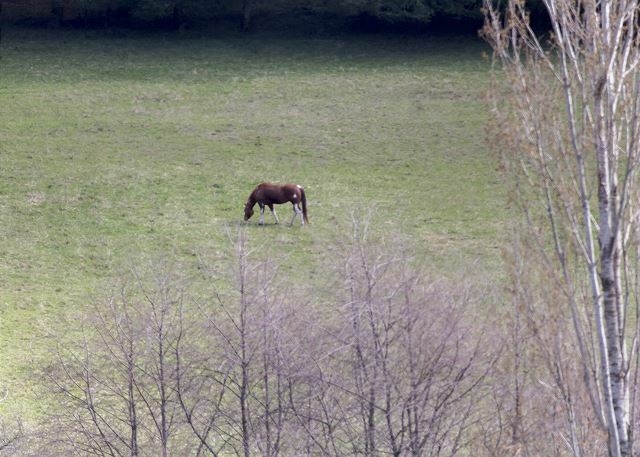 ***Please Note*** Though the home is a private residence, there are caretakers living on the property year round. Cherry Hill captured our heart! It was the perfect get away for my daughter, grand daughter and I. 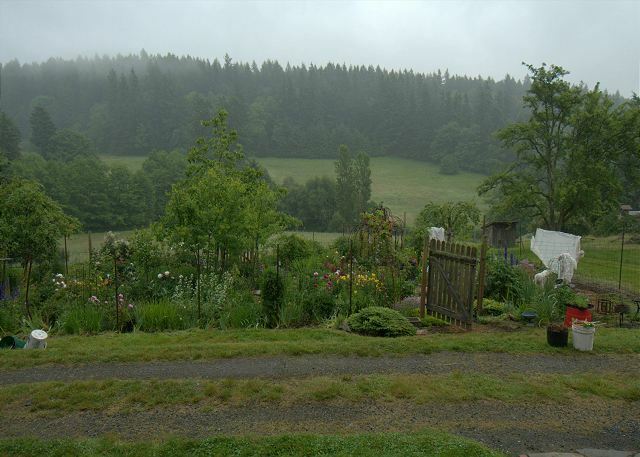 The view of the water, hillside and garden were breathtaking. You instantly feel at home and at ease. Thank you for sharing this slice of heaven. I will be back! We love to hear what a great stay you had! What a wonderful multi-generational vacation. Sounds like a peaceful and pleasant stay for your family. 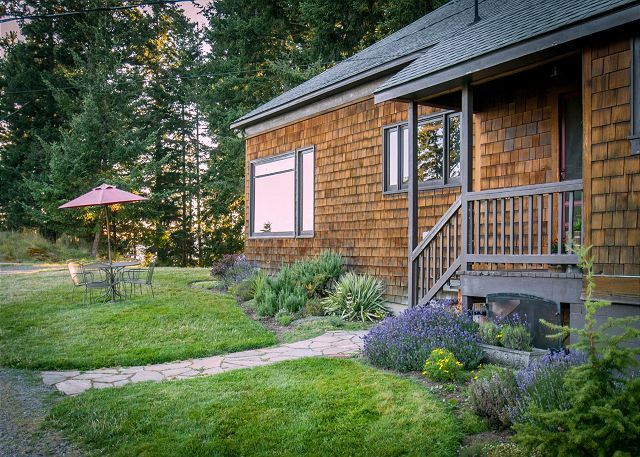 Great time enjoying the natural beauty of Ocras Island in this lovely cottage. Comfortable for our entire family in a really great location. We had 4 adults and 2 wee ones for a long weekend. First the location is beautiful and charming. 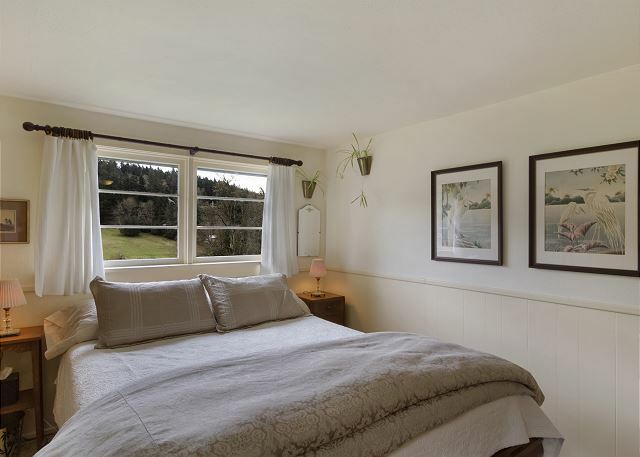 With the constant view of the water, sweet garden and deer meandering around, that made for a peaceful stay. I have never been to a home that is do thoughtfully appointmented. Truly,, everything one needs. The cabin was super clean. The mattresses are a bit fatigued but everything else was great. The little kids play area was so helpful. The “toy closet” was fun to unpack and explore. We had a fabulous time. The house was charming and well-equipped. The location perfect. We loved the combination of peace and quiet, outdoor adventures, and great places to eat. 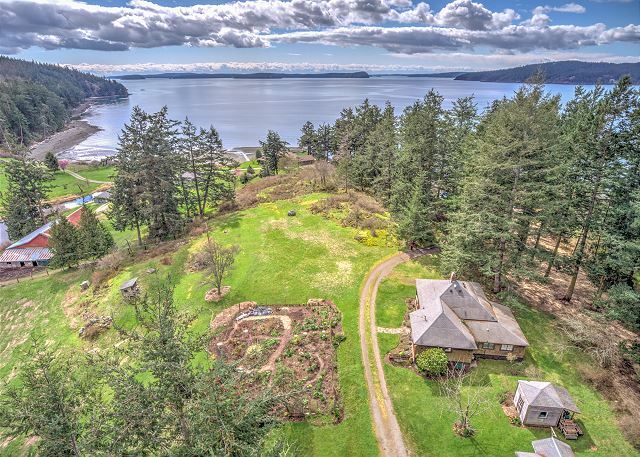 The only downside: We miss Cherry Hill and Orcas Island too much. Beautiful and peaceful place to vacation. Hang out and listen to birds, including Great Herons that roost in nearby trees. Watch the deer come to graze... Excellent proximity to Moran State Park - ride your bike to get ice cream or take a swim. Highly recommend! My husband and I stayed at the cottage with two other couples and had a fantastic time. The property is beautiful. We really enjoyed the garden (thanks for the onions!) and the view of the water. We spent a lot of time sitting outside at the patio table and enjoying the view. We cooked almost every night and the kitchen was very well stocked, and there were plenty of pots, pans, and dishes. We had minimal interaction with the property management company, but check-in was easy and we didn’t encounter any problems while we were there. One of the couples brought their 13-month old son and really appreciated the toys and books that were available for him. We walked over to Buck Bay Shellfish one day and highly recommend that. It was great shucking oysters outside and enjoying the view. None of us wanted to leave and we would love to go back. Thank you! Cherry Hill cottage is on a beautiful historical homestead on the more rustic and out-of-the way eastern lobe of the island. 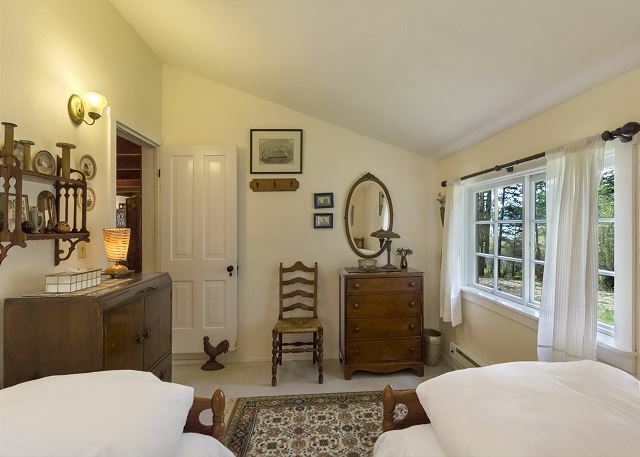 The house is beautifully maintained to highlight its history and was cozy, clean, and welcoming. Everything from the drawer pulls in the bathroom to the antique trivets in the kitchen is thoughtfully chosen. It was a fantastic place to stay with little kids--our kiddos loved the small rocking chairs, toy cupboard, and wonderful children's book collection. We enjoyed playing outside on the lawn and in the beautiful flower garden. Just down the road is the Buck Bay shellfish farm, a great spot to stop and grab fresh oysters. You can shuck and eat them right there in the outdoor eating area, or carry them back to the house. 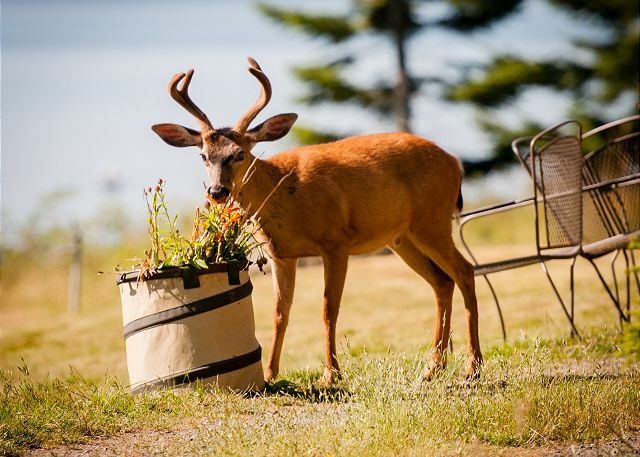 This spot is a longer drive from the ferry landing, but close to the Doe Bay resort, with its excellent cafe and soaking tubs, and only a few minutes from Moran State Park. Unlike a lot of house rentals, Cherry Hill's kitchen was thoughtfully stocked with most cooking essentials--olive oil, balsamic vinegar, a wide variety of spices, etc. The owner and property management company were very attentive and communicative, and were even able to hunt down a toy we left behind to get it back to us. Pretty much a perfect place to stay! My husband and I and two twenty-something children decided to take the Thanksgiving extended weekend and turn it into a family vacation of sorts. 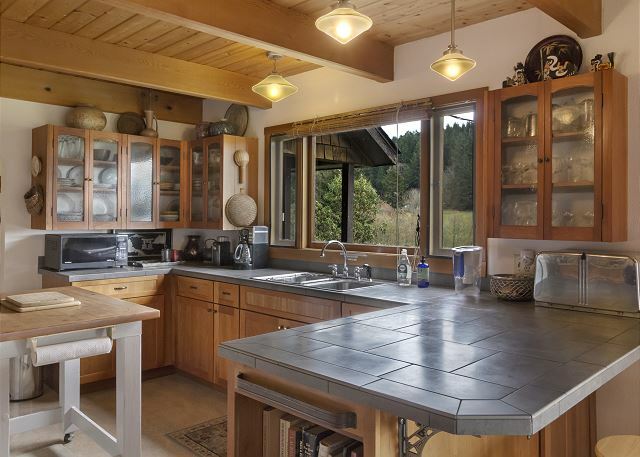 Our goal was to be able to relax, cook great meals, spend time together, and if the weather permitted, enjoy everything Orcas Island has to offer. 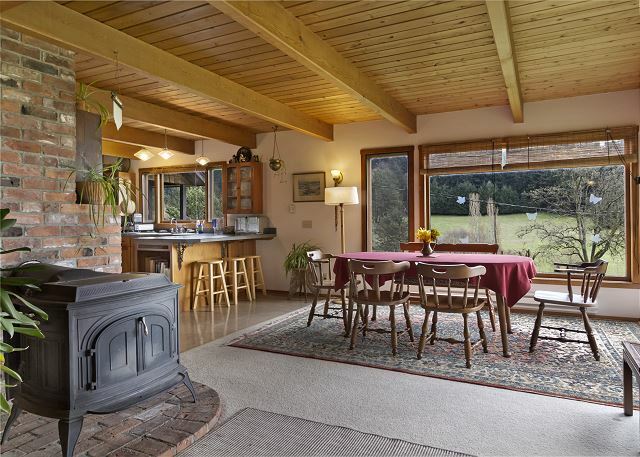 Cherry Hill Cottage was a perfect place to chill out: on a dead-end road with a water view on 20 acres, a totally cool homestead (remodeled) that is tastefully decorated, very cozy, a fabulous kitchen, and loaded with books and videos. It was perfect for the mostly rainy weekend; I can imagine how awesome it would be in sunny weather!! 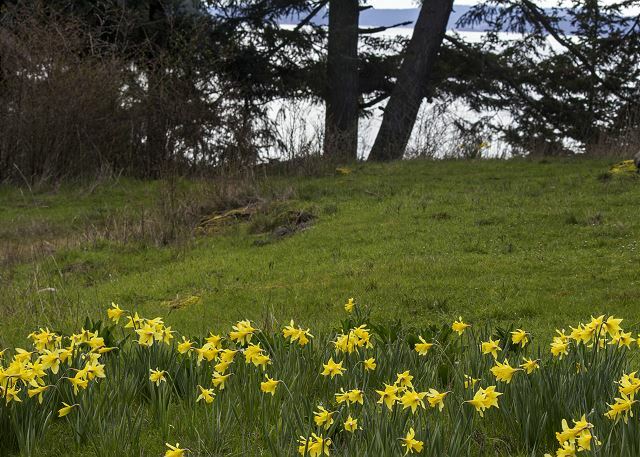 And the quick escape to nearby Orcas Island from Bellingham and Seattle is like going on a vacation without the price of 4 airfares (get a reservation on the ferry to omit stress). I would definitely recommend this place; we hope to go back. We had a wonderful time at the cottage and hope to return. My only suggestion is a new mattress for the master bedroom, which is uncomfortable. We enjoyed 7 days/nights at the Cherry Hill Cottage and loved it all. 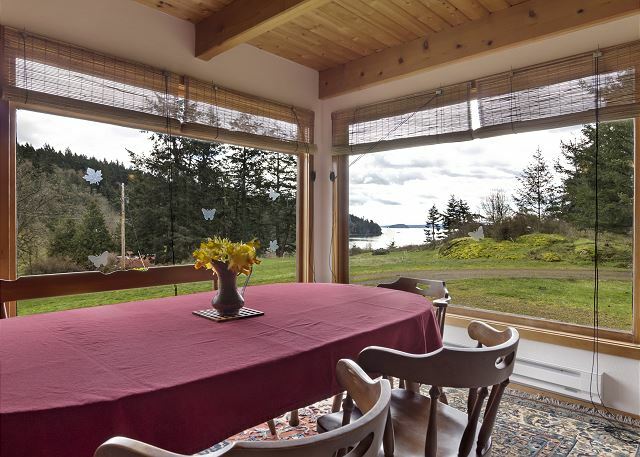 The location was perfect -- close to hiking/running trails, a beautiful view of Sound and easy access to beach. There was a fresh seafood place right down the lane, the owners let us pick fresh lettuce/peas/etc from their garden and the kitchen was stocked with all the basics, so dinners in were as good/better than eating out. It was a quick trip to Eastsound, Doe Bay and multiple state parks. We arrived on the first ferry on Saturday morning, so we made a day of it exploring the West side of Orcas, the Eastsound Farmer's Market and scoping out what we wanted to do for the rest of the week. 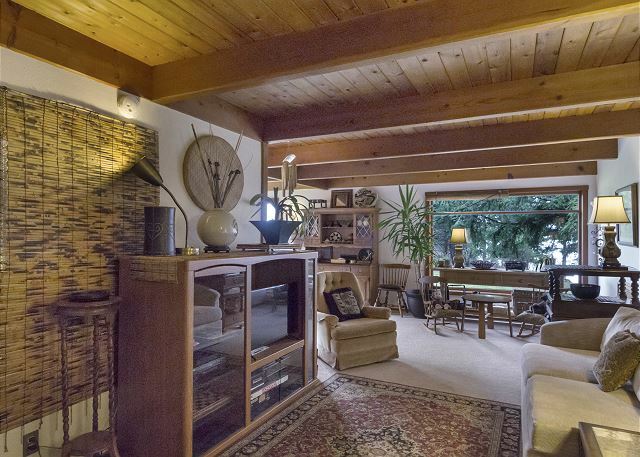 The house was super clean, the beds were comfortable, there were fun outdoor/indoor games, and the most amazing stockpile of movies if you wanted to spend the night in. We loved that cell access was limited around the island as we really did relax, but house had good WiFi if you do need to plug in. We are already thinking about planning our next trip there. Very comfortable cottage with every amenity we needed plus many more. Well-stocked kitchen, tons of fun retro toys and a wide variety of books that kept my 2, 7 and 9 year-olds begging to stay at the house rather than explore the island. Beautiful grounds with a great flower and veggie garden that we were encouraged to pick from and many acres for the kids to explore. 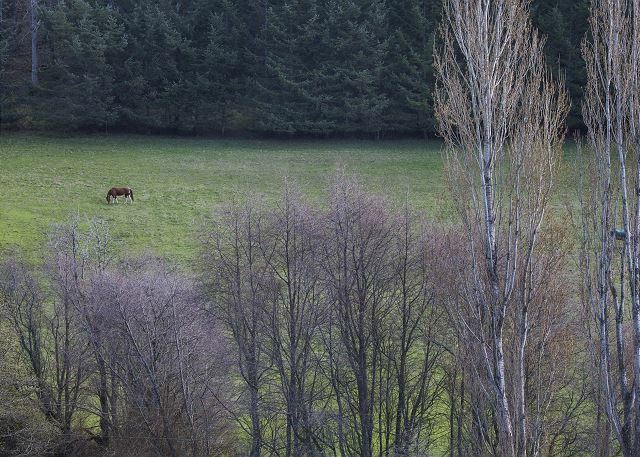 They especially loved having the neighbor's horses grazing in a distance in the field. Quick walk down the hill to the shore and a few minutes drive to the wonders of Moran State Park. We would highly recommend this place and hope to return some day. Our family of five (2 adults, three teenagers) thoroughly enjoyed our stay at the cottage. The grounds were beautiful and very private, with gorgeous views. We live in a pretty quiet place in Colorado, but this was even more quiet. Saw bald eagles in their nest right down the road, strolled to Olga for some exercise, bought scrumptious crab down the road from Buck Bay Shellfish Farm, and generally relaxed. The kitchen was well-stocked for easy cooking. 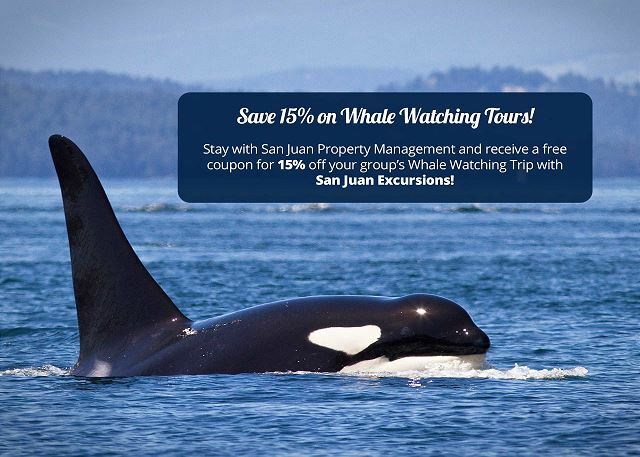 We saw a gazillion orcas on a whale watching excursion, so highly recommend doing one while staying there. Would love to still be there! 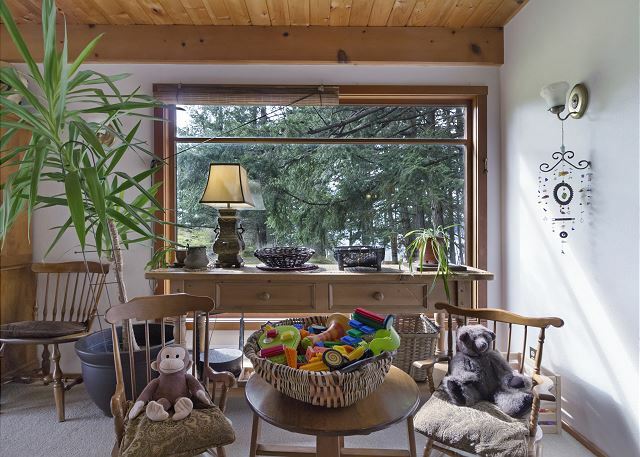 The cottage had everything we needed for our 4 day stay on Orcas. Very comfortable & clean, with lots of thoughtful extras like binoculars & local guide books. 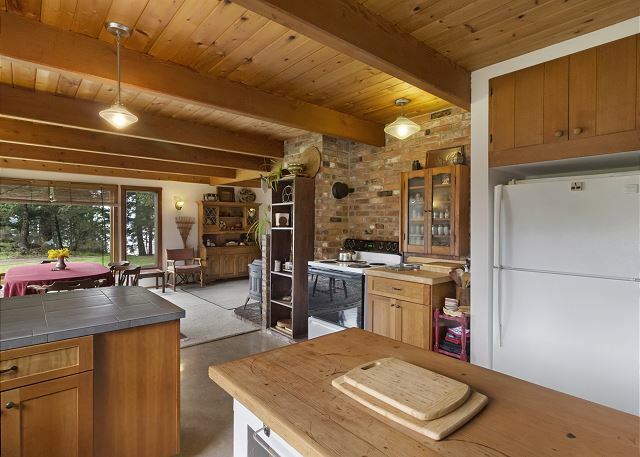 The kitchen is nicely updated, the deer were friendly, and the property is nice for strolling. Short drive to Eastsound for anything you could need. Would definitely stay here again! This house was perfect for us two grandparents, son, daughter-in-law and two children ages one and three. 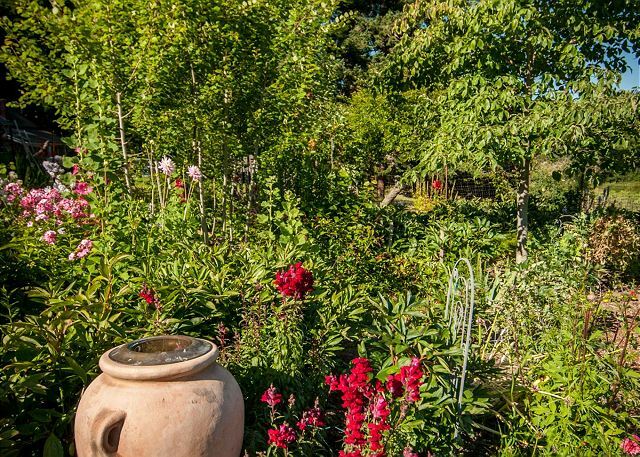 The fenced-in flower and vegetable garden provided endless possibilities for exploration by the little children, as did the two horses on the adjacent property, deer, walks to the pond and to the beach. 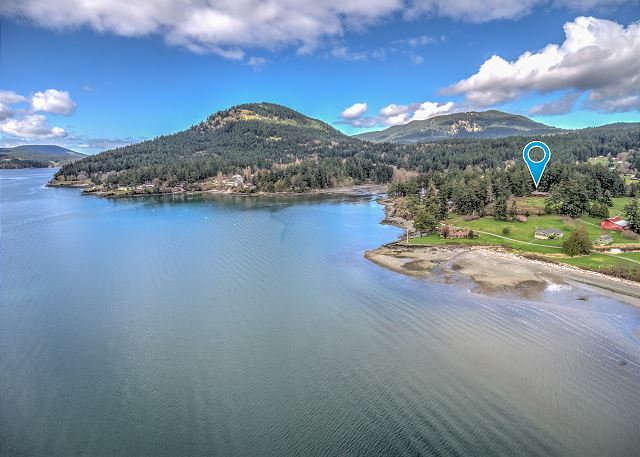 The distant views of field and water capture the essence of Orcas Island, making a peaceful setting. 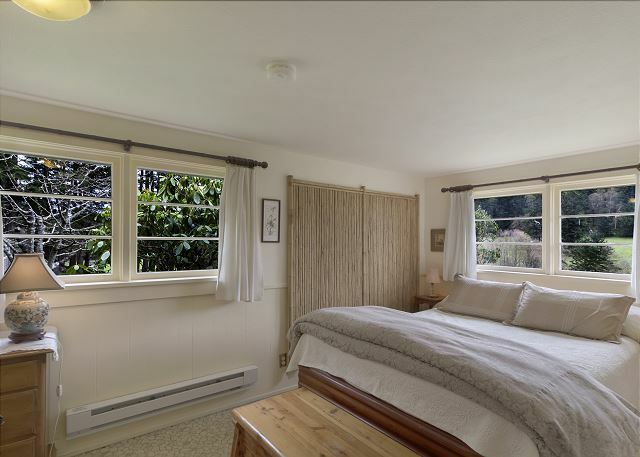 The house is simple, and very thoughtfully furnished, with every need attended to. There is a good collection of children's toys and books (and an extensive video library that we did not use). We did not miss a dish washer or an extra bathroom. Everything was perfect for us. We had a lovely visit to Cherry Hill Cottage. We enjoyed meandering the property, kayaking from the waterfront (the access from the property was manageable for us, but may not be for the more timid, it involved scampering up and down some rocks), watching the wildlife (deer and raccoons) and just relaxing. 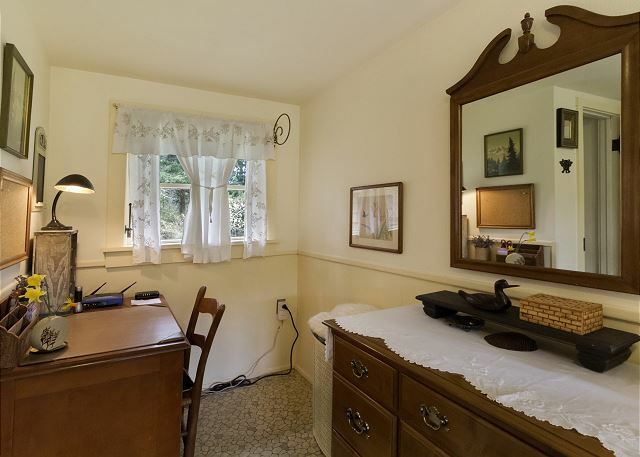 I'm hesitant to write much about Cherry Hill Cottage for fear of others discovering what a wonderful little place it is. 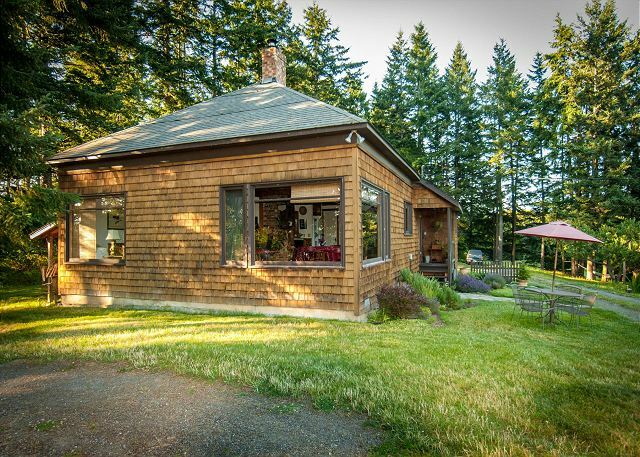 Truly, it is a gem of a vacation rental. 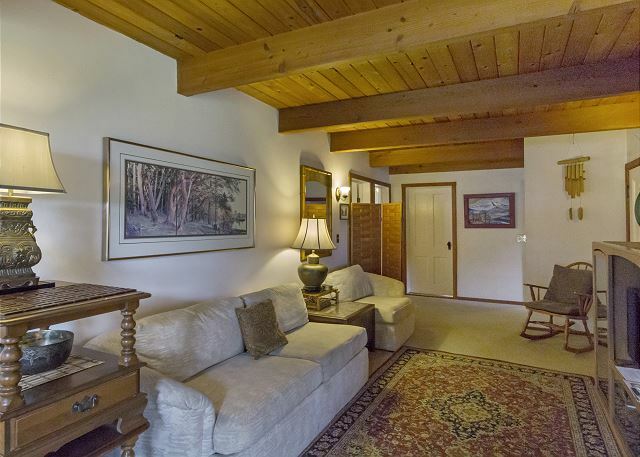 If you're looking for a quiet, peaceful retreat in a comfortable and well cared for home, this place can't be beat. The location is perfect if you need to be away from the noise of civilization. 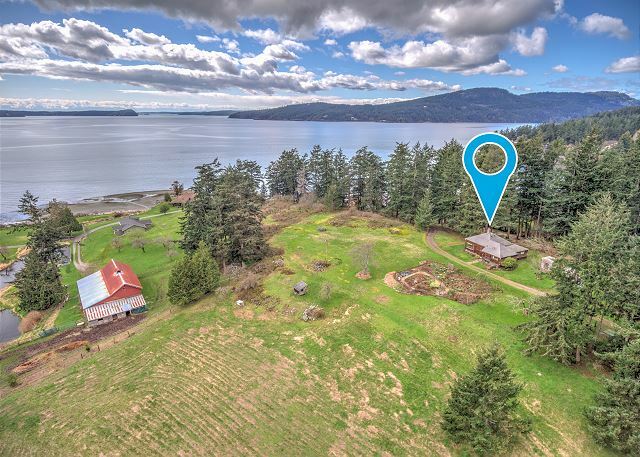 A pastoral setting with a view of the water, you can watch ferries pass in the strait while deer graze in the yard. Explore a small meadow or a rocky beach. 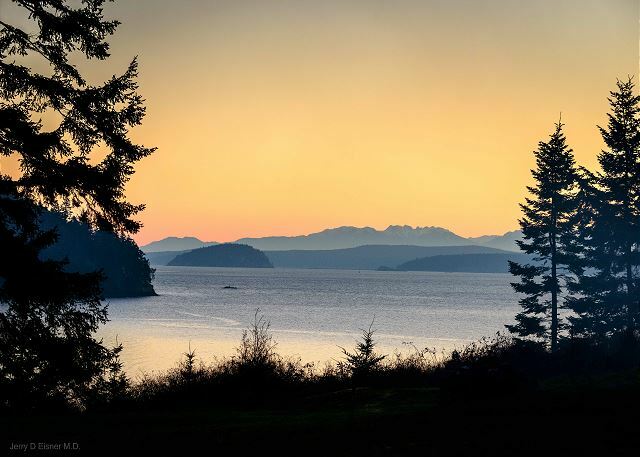 Moran State Park and the village of EastSound are a few miles away, an easy drive if you want to see the island. There are neighbors nearby, but you'll never see nor hear them. The primary sounds here are birds, waves, and wind in the trees. 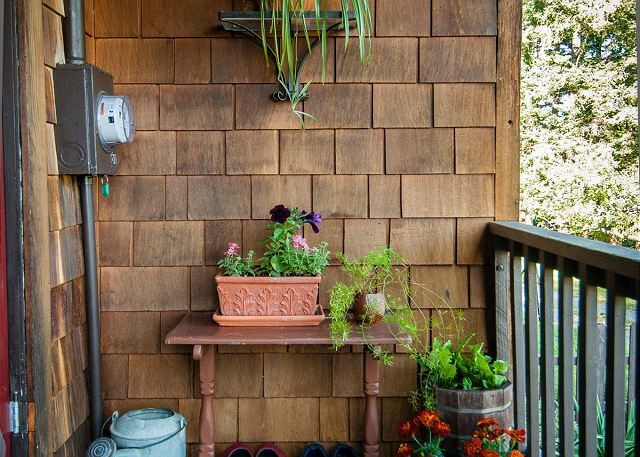 The cottage is mildly rustic but has everything you'll need to be comfortable. There are games, toys and movies for those entertaining kids. There's even decent internet access if you really need it. The flower garden right outside the window attracts bees and birds and deer (who are visibly frustrated by the necessary fence). 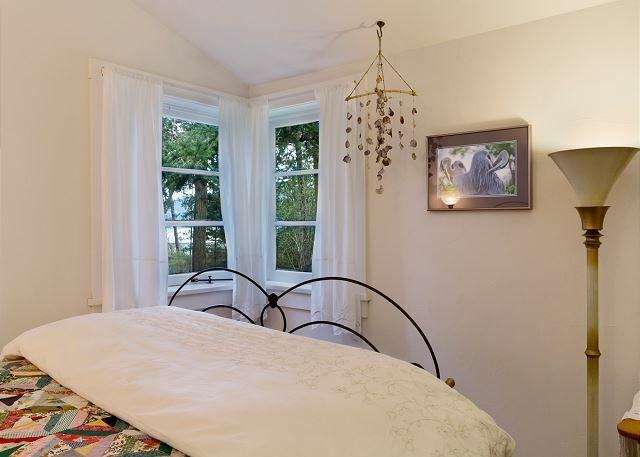 This is the perfect place for a few days of serenity on Orcas Island. This was one of the best vacations I've ever had and I say that is due in large part to the magic that is Cherry Hill. The owners are very kind and considerate, and we had more than a few meals with veggies from their garden. The weather was incredible, sunny most of the 4 days, and the property itself is so well loved, and sprawling with the wonderful vistas. Great place for privacy, R&R, no people around & no noise. Kitchen good for a chef & fine dining. Both queen mattresses could be upgraded, a little sagging. 3rd bedroom really cute and all set up for children. We loved the garden, fresh herbs for cooking, sitting and chatting in the garden during sleepy summer mornings. Great view of bay, and quiet valley pasture with a pond in the middle. Location close to Moran State Park for all kinds of hikes from easy to challenging, and swimming lake. We will definitely come back with our family members. Thanks to the owners for opening up this beautiful homestead to guests! We loved the ocean view, the wild deer, the beautiful garden. The house is older so there are uneven floor heights between the rooms. Be careful! Overall, we had a wonderful stay. 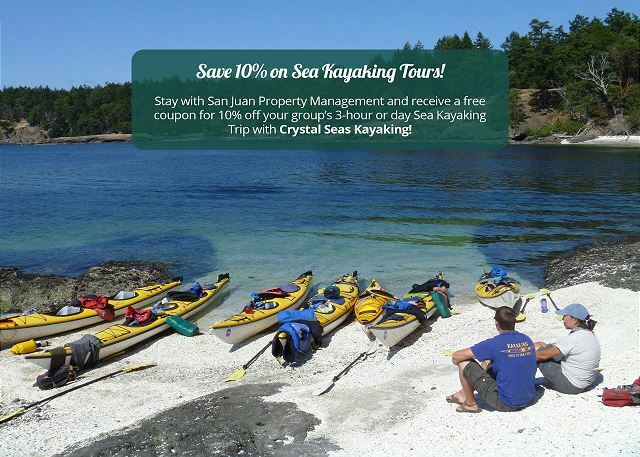 We had a wonderful stay on the San Juan Islands. Each night we looked forward to "coming home" to Cherry Hill Cottage. Overall, I'd say that the amenities were understated in the description: The view is amazing from rooms that matter! We dined looking out on Buck Bay watching the ferries. The weather was so nice we were able to eat dinner & have our morning coffee outside on the patio furniture overlooking the bay & the beautiful garden. The kitchen was well appointed, the linens were high thread count (yummy! ), and to top it off there were luscious flower arrangements (from their garden) in each room! We got use to the French press (no coffee maker). Plan at least 1/2 hour to get from the house to the ferry.